Oh, the power of persuasion. I am so touched by everyone's incredible enthusiasm over the giveaway (BTW-- have you entered yet???) Even though I haven't had the time to personally respond to all of your comments yet, I have been reading them all with great excitement! I asked you all what you would do with black cocoa powder, and I've been loving the responses. Man, you guys are creative--I mean, mole sauce with black cocoa? Who would of thought of that! An incredible number of you commented that you would make black cocoa brownies, and the more I read about black cocoa brownies, the more I started to really crave them. Yes, the power of mob persuasion and mass suggestion at work. So, the logical course of action was of course to whip up a batch of my own black cocoa brownies, just so you all know that it can be done. And the results? Fantastic. Of course, being me, I couldn't leave well enough alone, so I present to you another use of these salted black cocoa brownies, if you manage to stop eating them long enough to make it to this point: the Eyjafjallajokull parfait. Yes, you will ask--why in the world am I naming these parfaits after Iceland's recently-infamous volcano? Well! First of all, these parfaits are made with plain Icelandic skyr, which are the perfect base of smooth, creamy, thick, and tart goodness. 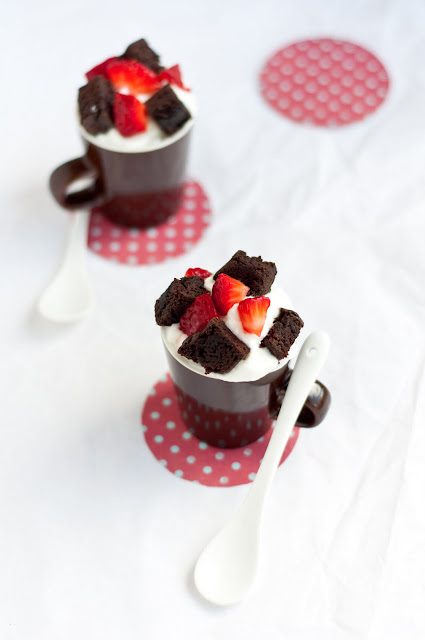 Then, layered underneath and on top are alternatively the season's first strawberries, macerated in lemon juice and vanilla sugar, and chopped up cubes of salted black cocoa brownies. For some reason, the skyr made me think of Iceland, and then the strawberries and black cocoa brownies made me think of lava and volcanic rock, respectively, sitting on top of a rich mountain of skyr, and thus was borne the name "the Eyjafjallajokull parfait." 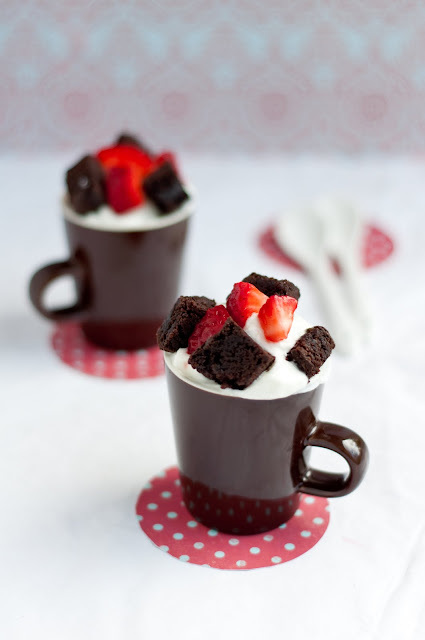 Or, if you don't want to try pronouncing that, you can just call it the "Strawberry, black brownie, and skyr parfait." 2. Yes! the walk through the forest totally reminded me of the video game Myst. Actually, the original title for "Descent" was "Descent into Mystverse." I am a geek, just like the rest of you. 3. Someone mentioned self-saucing pudding cake. I am *so* intrigued by this. Can anyone point me in the direction of a recipe? 4. For those of you who have asked if you can buy prints: I just showed my collection so I haven't had any time to think about prints beyond the limited edition ones of the collection. I will look into this further (maybe via imagekind) and get back to everyone! If you are interested in the limited edition prints from the entire collection, in their original intended sizes, please contact me individually at s "at" shihbakes "dot" com. 1. Preheat oven to 350 degrees F. Using the salted butter, grease the bottom and sides of the pan(s). Set aside. 2. In a large bowl, whisk together the sugar, flour, cocoa powders, baking powder, and salt. Set aside. 3. In a separate bowl, combine the eggs, melted butter, and vanilla extract. 4. Combine the wet ingredients with the prepared dry ingredients, folding until all of the dry ingredients are incorporated. Batter will be very thick and difficult to stir. 5. Pour the batter into the prepared pans, smoothing the tops. Sprinkle liberally with coarse sea salt. 6. Bake for 35-40 minutes if using a 9 x 13" pan and for 25-30 minutes if using two 8" pans. Be careful not to over-bake. 1. Combine and toss together gently the strawberries, a sprinkling of lemon juice, and vanilla sugar to taste. Let sit while you prepare the skyr. 2. Pour a small amount of half-and-half into the skyr and stir together, until the skyr's consistency resembles thick yogurt. 3. 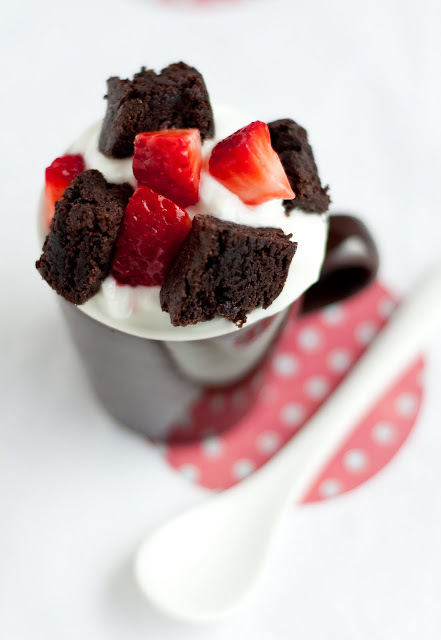 Layer between and top skyr with chopped brownies and macerated strawberries. What an amazing concoction you've created! Great job on the pictures as well. They're terrific! Thanks for sharing! Salted brownies are the best! That sweet and salty gets me going every time. I bet those brownies would also be excellent over some vanilla bean ice cream...then again, what wouldn't. Yum, salty/sweet is my alltime favorite combo. And I think, the darker the brownie, the better. I made the Salted Brownies with 6 oz melted unsweetened chocolate instead of the cocoa powders, baked in a 9X13 pan. The mixture was relatively dry to begin with, and I only had to bake it for 20 minutes. It came out great, although a little dry. Not sure what to do to compensate for that. Maybe use less flour? Anyway, overall, they came out great! The coarse sea salt adds the kick that makes this an excellent recipe! With a little vanilla ice cream, it's incredible! Thanks for the recipe! Stunning! I never would have thought to use the black cocoa as food coloring. Genius! I clicked over from foodgawker. Big mistake. 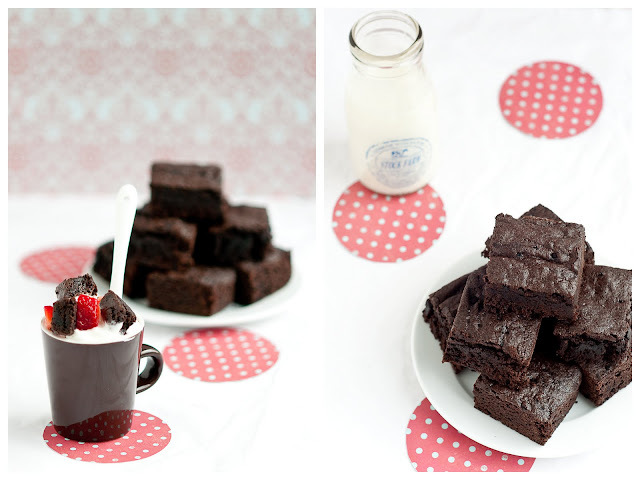 Now I am craving these brownies:) Love the photos! 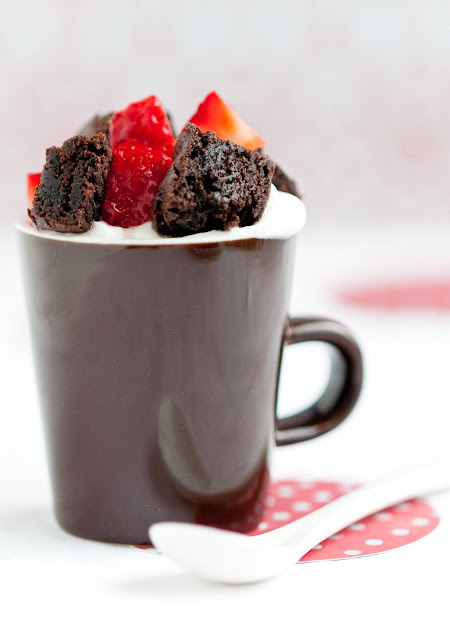 Brownies in a mug. What a novel way of presenting them. 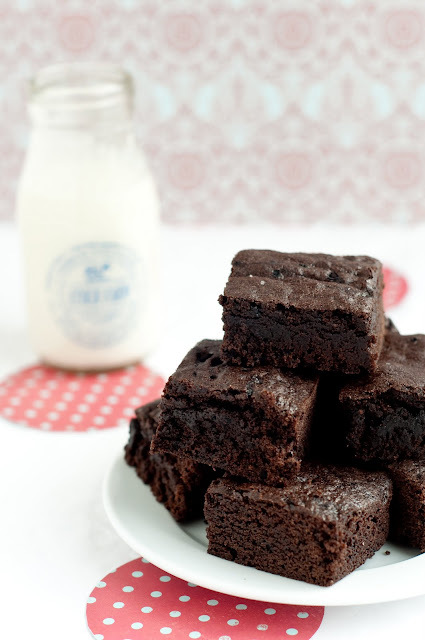 This looks great and the extra dense brownies really appeal to me. I am absolutely stoked that I found your blog. I've been reading through your entire archives (abit like a crazy cake-obsessed stalker) and just droooling! I've just recently seen the pictures of the volcano.. I don't know if they're real but they look insane! Have you seen the wacky coloured lightning coming out of that thing?? and.. your parfait does it justice :D an insane looking array of different colours. So happy to see the results of that setup - great, of course! 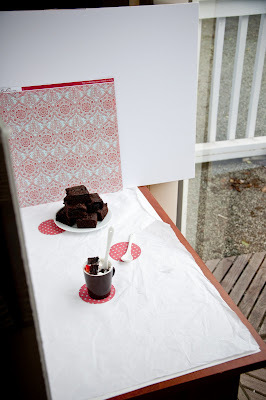 I am always on the lookout for awesome brownie recipes. The darker the better, I say. And how awesome is the parfait idea? Speaking of ways to use brownies as an ingredient, I've had a cheesecake recipe with brownie chunks in it bookmarked for years. These look delicious. What is a good recommendation for a black cocoa powder? I only have natural process or dutch processed. Thanks! @Jenny: King Arthur Flour has black cocoa powder. Hi Char, I'm sorry that you thought this recipe was too salty! If you have a picture, I'd be happy to advise on how much salt to use. I used the word "liberally" because, after all, it's a salted dessert, so it should be more liberally salted than your average, run-of-the-mill sweet. Brownies were perfect. Followed the recipe exactly. It was super thick, the batter I mean, but they weren't dry after they were baked. Perfect cake-like brownies. I suggest adding mini chocolate chips or pieces of mint chocolate to the batter.